by Kozo: It won’t go away, but nobody’s really asking it to. The successful Troublesome Night series continues its low-budget assault, and the result is the second best in the series. Like previous installments, a common theme ties a triptych of stories together. 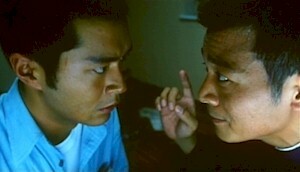 We’re introduced to Simon Lui and Louis Koo as taxi drivers who have the bad luck of picking up obnoxious spirits. In the first story, Lui can’t seem to escape passengers who either are ghosts or simply seem like them. In the second story, Ah Fa (Koo) enters into a pact with a tricky spirit (Ben Ng) who provides luck at the races in exchange for far more than Ah Fa bargained for. For the third story the film jumps ahead one generation to Ah Fa’s son (John Tang), who inherits a security post in a haunted high rise.